Last session, I introduced six interim study resolutions. Of these, four will receive public hearings in their respective committees this fall. The first of these hearings is scheduled for Friday, October 24th. In the morning, I will present the findings from interim study LR 583 to the Health and Human Services committee. LR 583 examines the Nebraska Department of Health and Human Services’ policies around Medicaid eligibility for former foster youth who were not adopted or under a legal guardianship when they became an adult. Under the Affordable Care Act, former foster youth are eligible for Medicaid until age 26. This pathway to insurance mirrors a similar pathway for other youth adults who are eligible to remain on a parent or guardian’s health insurance plan until age 26. Prior to our study, the state was interpreting this policy to apply only to former foster youth who aged out at 19. Our study revealed that this left out more former foster youth than it included since so many leave the system at 18. I am happy to report that the state will now cover former foster youth who leave at age 18 as well. Insurance coverage for this population is very important for a variety of reasons, not least of which is that former foster care youth are more likely than their peers to suffer from a chronic physical or mental health condition. If you know of former foster youth who could benefit, please encourage them to apply here by clicking on the Healthcare/Medicaid Application button. In the afternoon, I will present the results of our interim study regarding unfunded mandates to counties, LR 582. Earlier this summer, our office, in cooperation with the Government, Military and Veterans Affairs Committee and the Nebraska Association of County Officials, held a series of conference calls with county officials regarding unfunded mandates and their impact on property taxes. These calls helped us identify a number of unfunded mandates to counties, including those which are particularly burdensome for counties. 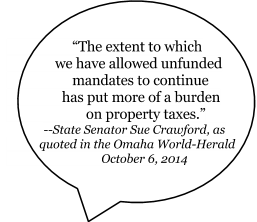 We will present a full list of these unfunded mandates at the hearing. The Government, Military and Veterans Affairs Committee will also hold a hearing on unfunded mandates on Wednesday, October 29th in South Sioux City. In November, we will present the results of two additional interim studies. On Friday, November 7th, I will testify in front of the Urban Affairs Committee regarding how cities and villages provide services to residents who live in a sanitary improvement district. On Friday, November 14th, I will appear before the Judiciary Committee to examine issues surrounding compassionate waivers for the use of CBD oil for treatment of children with epilepsy whose seizures are not adequately treated by current available drugs. A few weeks ago, I organized a meeting at The Lodge regarding economic development in South Sarpy County. Approximately 30 residents and business owners came out on a stormy Tuesday afternoon to hear about future development plans from the City of Bellevue, Sarpy County, Nebraska Department of Roads, Bellevue Chamber of Commerce, Burlington Northern Railroad, and the Missouri Papio NRD, to name a few. Topics of discussion included levee improvements to comply with new FEMA standards, the closure of LaPlatte Road, and the elevation of Highway 34 given flooding in the area in 2011. I appreciate the willingness of so many public officials to be there to talk about future plans for the area and to answer questions. We are planning a discussion with the Nebraska Department of Roads regarding road work on Fairview Road later this fall. If you live or work in the South Sarpy area and would like to be notified of future meetings, please contact our office to get on a mailing list. 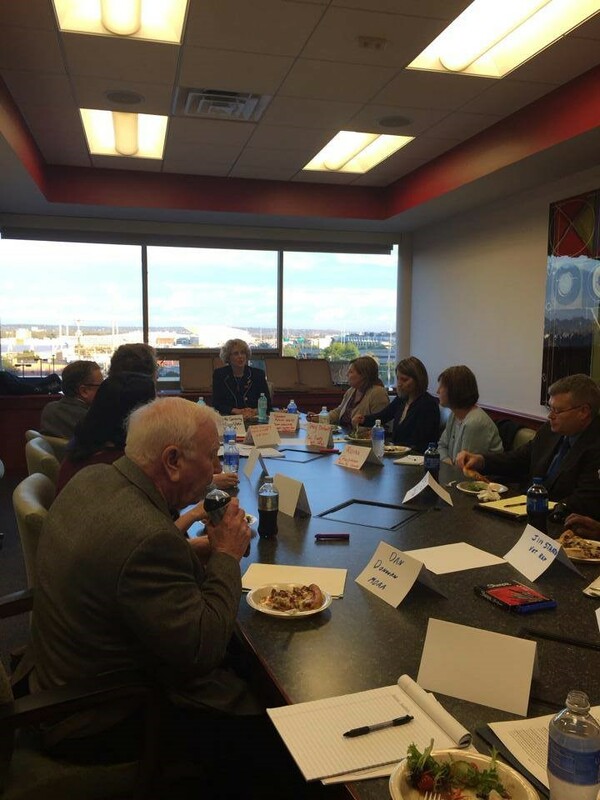 Last Thursday, I hosted a veterans roundtable discussion at Creighton University’s Werner Institute. The discussion was facilitated by Palma Strand, a colleague of mine and professor at Creighton University School of Law. The roundtable focused on state policy options to support active duty military and veterans in our state including child custody arrangements during deployment, transitional assistance for recent veterans including career licensing and family supports, access to state and federal veterans benefits, and tax policy. It was a very informative discussion and I appreciate the attendees’ thoughtful feedback on the issues we brought before them. Many of the attendees are veterans who continue to serve their communities and their fellow veterans in their roles as county veteran service officers, service providers, and advocates. I am grateful for their continued service. On Tuesday, October 21st, I will serve as a panelist at Putting Family First: How Paid Leave Helps Families Succeed. The event will take place from 8:30-10:30 AM at the Kroc Center, 2825 Y Street, Omaha. Ellen Bravo, a national expert from Family Values@Work, will join me and other local panelists to discuss the current challenges Nebraska families face and how we can better ensure that workers are able to put family first during significant life events. The event is free and breakfast will be provided, however registration is required. To register, please visit: http://voicesforchildren.com/2014/10/register/. I hope you can join us! In 1991, the Legislature created an economic development tool for cities. City residents must vote to approve use of this tool. Proposition 1 on the ballot this November asks Bellevue voters to approve use of the tool to develop the new Highway 34 corridor. Come learn about the proposal October 14th from 6:30-8:00 PM at Bellevue University’s Hitchcock Humanities Center in the Criss Auditorium.